I made this game this weeked for the Ludum Dare competition. More than 70% into it I was still convinced it wouldn't turn into a fun game at all, but eventually I managed to bring it all together. It is fun, but a way to restart a failed level without waiting ages to die would be a big improvement. Cool, old school - I like it. yeah, i forgot to add a way to reset a level.. Unfortunately, the 48 hours are over. Nice pixel work, I really like the animation when bunnies got crushed . Did you make the sound too? Unfortunately I got stucked at a level where the key was destoried but my character survived. Really cute art and animations. There were times when I thought "I wish there wasn't a minimum time between each bunny crush - I have failed it and it's taking too long to kill them all"
I guess a way to invoke a restart would fix that. Yeah you should release a post-LD update where you can press R to restart. I haven't finished specifically because I got annoyed waiting for all the bunnies/me to die in order to try again. I've added the ability to reset the level with escape or backspace (you might have to restart your browser to clear the applet cache). Also, here's a timelapse of me making the game. hehe great stuff. what program is it that your using to create the sprites? and the timelapse? I mostly use paint.net. It's not bad, but not great either. For the timelapse, I use a tool called "chronolapse". It was made by one of the people in the Ludum Dare competition. It spits out a bunch of png images, and I then process them with the command line tools from image magick, then convert them into an avi using mencode. Yep, cool and quick to play. Fits nicely with web games you play when you have a few minutes. I got squashed in level 3 but played only one time. It was better with the reset button. I love the maps when you needed the help of the bunnies. The time lapse coding video is genial! Very nice job! 48 hours, huh? I ended up not dieing in one level, but not getting a key and just stood around. That's amazing you could do that in 48 hours. I can hardly do anything in that amount of time. The instructions came a little fast, maybe letting someone click after they read them on each level would have been better. Once I get things figured out a little more in java, I want to cut my development time way down. Not enough for Ludum Dare because of the rules about not reusing code, but maybe a game every couple months. What a fun game! I'm amazed you did it all in 18 hours! All the detail in the graphics, sounds, and brilliant game play! Excellent job! ...and one of the few games I actually made it all the way to the end. For me, the trick to getting a game done that fast is to start by getting something playable as soon as possible. This doesn't mean it has to be a game in any way, but it has to be interactive. That way, I can start play testing immediately, and only add the stuff I feel is missing. Like in this game, I made a white square move around in a black background (or the other way around? 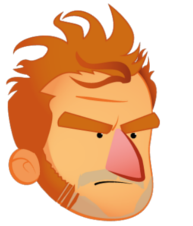 ), and thought "You know, this character should really have some graphics", so I added it. And I kept going like that. Towards the end, I kind of realized I was running out of time, so I started doing things backwards. I started by adding an ending, then added stuff in the middle until they joined up. Unsurprisingly, mine was pretty far behind in most categories. I got top 10 in technical and graphics, which isn't too bad.